Looking for some Spring Break Hot Spots for Cool Skiing? While many spring breakers head to the beaches, some of you are taking advantage of this last chance to hit the slopes. And it's a good bet that the 21st Winter Olympic Games have also put an itch in your ski boots. Speaking of which, now is the time to rent a timeshare at Whistler, and explore first-hand this 2010 Winter Olympic venue. Ski the slopes where history was made in February. As you heard NBC's Bob Costas mention, the Whistler-Blackcomb ski area is the largest in North America. And also take the time as you pass through Vancouver to check out the Winter Olympic sites that you only got to see on television. Jackson Hole, Wyoming, has some of the most stunning scenery any skier could ask for. Nestled beside the breathtaking Grand Tetons, skiing here is like being immersed in an unbelievable movie set. There are still some great Jackson timeshares for rent for your springboard to awesome skiing at the world-famous Snow King Resort, whose slopes rise almost right up from the town square, or popular Jackson Hole Ski Resort, just 12 miles out of town. And don't forget the incredible off -slope activity of visiting the largest Elk Reserve in the United States, where you can get up close and personal with hundreds of these magnificent animals. You can even take a sleigh ride there! See Jackson Hole timeshares. For skiing that is on par with anything you'd find in the European Alps, head toward Ski Country, U.S.A. - Colorado, where the spectacular deep powder skiing is unrivaled. Rent a timeshare in historic Breckenridge for great skiing and snowboarding, among numerous other types of winter fun. For a unique Spring Break activity, try an exciting dogsled ride - sure to clear your head of any remnants of classroom cobwebs. 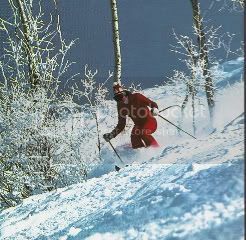 Skiing the Champagne Powder® of famous Steamboat Springs can be the highlight of your ski season. Rent a Steamboat Springs timeshare at this popular Colorado ski area and enjoy all that it has to offer the intrepid skier. For great après-ski fun there are two hot springs where you can have the exhilarating experience of soaking in steamy water while surrounded by snow. Consider renting a timeshare at Lake Tahoe for skiing choices that are many, varied, and unbelievable. A hidden jewel in the Sierra Mountains, Lake Tahoe is the largest fresh-water alpine lake in North America. This remarkable ski area straddles the borders of California and Nevada, and offers more than 100 lifts and more than 500 runs over 17,000 acres of terrain. Due to an El Nino weather pattern the area has received record snowfall and expects its ski season to run into the first of May. See Lake Tahoe California timeshares. See Lake Tahoe Nevada timeshares.